"At that point in time," recalls Box, "myself and Trev paid a visit to David Byron to ask him if he'd like to join the band again. We had the deals and the money in our pocket while he was still trying to put something together and we couldn't believe it when he said he didn't want to know". 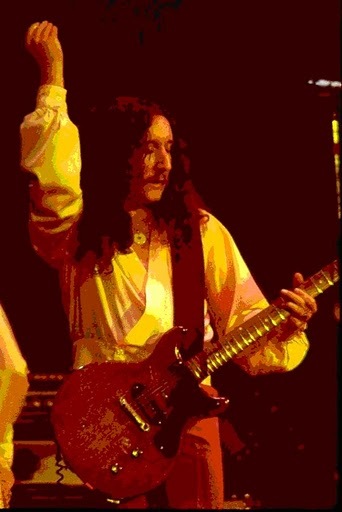 Trevor Bolder then decided to accept to join Wishbone Ash ("I didn't really want to leave, I just thought it was maybe time to try something different. I'd had enough of Gerry Bron and the management".). Then Dechert gone away. After all it seemed that Uriah Heep came to an end. "I locked myself in my flat for two days and drank myself senseless in complete self-pity. But I somehow managed to pull myself together and consider my options. Neil Warnock, my agent, was suggesting I go out and do the guitar hero thing, because the time was right, but I wanted to look at the possibilities of Heep still. I was getting a lot of mail from fans all over the world, saying how we had been a part of their lives, and also lots of kids just discovering us too, so I was encouraged by that quite a lot", says Box. From that moment the Uriah Heep rebuilding started to take place. First Box rang Lee Kerslake (who had meanwhile co-founded Blizzard of Ozz with Ozzy Osbourne, appearing on the eponymous debut and 'Diary Of A Madman' albums), initially unaware that the drummer and bassist Bob Daisley had just left the bat-biting one. ("Ozzy's a great guy and he meant well but he allowed him set to be manipulated", says Lee.) "I suddenly realised we had the basis of the new Heep", recalls Mick. Kerslake and Daisley were interested, with the former happy that the previous problems had been eradicated, and a rehearsal later the three of them were considering keyboard players. "Then the name John Sinclair came up (who'd supported Heep many years ago while in the Heavy Metal Kids), we tracked him down working with a band called Lion in Los Angeles, brought him over and that was it, like it had always been". The frontman had to be Peter Goalby (ex-Trapeze) (ex-Argent John Verity was considered too). "We obviously couldn't continue in our previous direction (Conquest) and we couldn't do any more Return To Fantasy, that era had gone. But with us all contributing to the writing we forged our new direction", adds Box. "We had some dynamite songs and the important thing was that we continued to look ahead, I realised that it was coming together when we were interspersing our new songs from Abominog with our old ones and they all sounded as if they belonged".